Kingston upon Thames, also known as Kingston, is an area of south west London, England, located 10.4 miles (16.7 km) south west of Charing Cross. It is the administrative centre of the Royal Borough of Kingston upon Thames, and identified as a major metropolitan centre in the London Plan. Kingston lies approximately 33 feet (10 metres) above sea level. It is notable as the ancient market town in which Saxon kings were crowned. Kingston was part of a large ancient parish in the county of Surrey and the town was an ancient borough, reformed in 1835. It has been the location of Surrey County Hall from 1893, extraterritorially in terms of local government administration since Kingston became part of Greater London in 1965. Most of the town centre is part of the KT1 postcode area, but some areas north of Kingston railway station have the postcode KT2 instead. The population of the town itself, comprising the four wards of Canbury, Grove, Norbiton and Tudor, was 43,013 in the 2011 census. Kingston was called Cyninges tun in 838, Chingestune in 1086, Kingeston in 1164, Kyngeston super Tamisiam in 1321 and Kingestowne upon Thames in 1589. The name means 'the king's manor or estate' from the Old English words cyning and tun. It belonged to the king in Saxon times and was the earliest royal borough. It was first mentioned in 838 as the site of a meeting between King Egbert of Wessex and Ceolnoth, Archbishop of Canterbury. Kingston lay on the boundary between the ancient kingdoms of Wessex and Mercia, until in the early tenth century when King Athelstan united both to create the kingdom of England. Probably because of the town's symbolic location, several tenth-century kings were crowned in Kingston, Æthelstan in 925, Eadred in 946 and Æthelred in 978. Other kings who may have been crowned there are Edward the Elder in 902, Edmund in 939, Eadwig in 956, Edgar in about 960 and Edward the Martyr in 975. It was later thought that the coronations took place in the chapel of St Mary, which collapsed in 1730, and a large stone recovered from the ruins has been regarded since the eighteenth century as the Coronation Stone. It was initially used as a mounting block, but in 1850 it was moved to a more dignified place in the market before finally being moved to its current location in the grounds of the guildhall. For much of the 20th century, Kingston was a major military aircraft manufacturing centre specialising in fighter aircraft – first with Sopwith Aviation, H G Hawker Engineering, later Hawker Aircraft, Hawker Siddeley and eventually British Aerospace. The renowned Sopwith Camel, Hawker Fury, Hurricane, Hunter and Harrier were all designed and built in the town and examples of all of these aircraft can be seen today at the nearby Brooklands Museum in Weybridge. Well known aviation personalities Sydney Camm, Harry Hawker and Tommy Sopwith were responsible for much of Kingston's achievements in aviation. British Aerospace finally closed its Lower Ham Road factory in 1992; part of the site was subsequently redeveloped for housing but the riverside part houses a community centre and sports complex. The growth and development of Kingston Polytechnic and its transformation into Kingston University has made Kingston a university town. The town of Kingston was granted a charter by King John in 1200, but the oldest one to survive is from 1208 and this document is housed in the town's archives. Other charters were issued by later kings, including Edward IV's charter that gave the town the status of a borough in 1481. The borough covered a much smaller area than the ancient parish, although as new parishes were split off the borough and parish eventually became identical in 1894. The borough was reformed by the Municipal Corporations Act 1835, becoming the Municipal Borough of Kingston-upon-Thames (then spelt with hyphens). It had been known as a Royal borough through custom and the right to the title was confirmed by George V in 1927. Kingston upon Thames has been the location of Surrey County Council since it moved from Newington in 1893. In 1965 the local government of Greater London was reorganised and the municipal borough was abolished. Its former area was merged with that of the Municipal Borough of Surbiton and the Municipal Borough of Malden and Coombe, to form the London Borough of Kingston upon Thames. At the request of Kingston upon Thames London Borough Council another Royal Charter was granted by Queen Elizabeth II entitling it to continue using the title "Royal Borough of Kingston upon Thames" for the new borough. Kingston was built at the first crossing point of the Thames upstream from London Bridge and a bridge still exists at the same site. It was this 'great bridge' that gave it its early importance in the 13th century. Kingston was occupied by the Romans, and later it was either a royal residence or a royal demesne. There is a record of a council held there in 838, at which Egbert of Wessex, King of Wessex, and his son Ethelwulf of Wessex were present. In the Domesday Book it was held by William the Conqueror. Its domesday assets were: a church, five mills, four fisheries worth 10s, 27 ploughs, 40 acres (160,000 m2) of meadow, woodland worth six hogs. It rendered £31 10s (£31.5). In 1730 the chapel containing the royal effigies collapsed, burying the sexton, who was digging a grave, the sexton's daughter and another person. The daughter survived this accident and was her father's successor as sexton. Kingston sent members to early Parliaments, until a petition by the inhabitants prayed to be relieved from the burden. Another chapel, the collegiate chapel of St Mary Magdalene, The Lovekyn Chapel, still exists. It was founded in 1309 by a former mayor of London, Edward Lovekyn. It is the only private chantry chapel to survive the Reformation. With the coming of the railway in the 1830s, there was a great deal of development to the south of the town. Much of this became the new town of Surbiton, but the Surbiton Park estate, built in the grounds of Surbiton Place in the 1850s, remained part of Kingston during the period of the Municipal Borough of Kingston-upon-Thames. A permanent military presence was established in the borough with the completion of The Barracks in 1875. Kingston straddles two Parliamentary constituencies: the area north of the railway line is part of Richmond Park, which is represented by Zac Goldsmith of the Conservative Party, and the area south of the railway line (including the ancient town centre) is part of Kingston and Surbiton and is Ed Davey of the Liberal Democrats. Central Kingston is a busy predominantly retail centre, with a small number of commercial offices and civic buildings. The shopping centre includes a shopping mall, "The Bentall Centre", containing the Bentalls department store and large branches of chain stores found in many British high streets. There is a large branch of the John Lewis department store group, with a Waitrose supermarket, located in the basement. The Rotunda, located in a former Bentalls furniture depository building (a local landmark), includes a bowling alley, fitness centre, a 15-screen Odeon multiplex cinema and a few restaurants. Recent developments along the riverside south of Kingston Bridge have added bars, restaurants and a theatre, the Rose Theatre which opened in 2008 with Sir Peter Hall as the director. Kingston's civic buildings include a local museum, public library, modern Crown Court and smaller county court and the Guildhall by the part-culverted mouth of the Hogsmill River which houses Kingston Council and magistrates' court. A short distance away is the County Hall Building which houses the main offices of Surrey County Council. From 1893–1965, before Kingston became one of the 32 London boroughs of Greater London, it was the county town of Surrey following the period of 1791–1893 when Newington had this role. Guildford has officially reclaimed this ancient, now ceremonial title as Kingston is no longer administered by Surrey. Kingston's main open space is the River Thames, with its lively frontage of bars and restaurants. Downstream there is a walk through Canbury Gardens towards Teddington Lock. Upstream there is a promenade crossing the Hogsmill river and reaching almost to Surbiton. Across Kingston Bridge is a tree lined river bank fronting the expanse of Hampton Court Park. Kingston has many pubs and restaurants and several public houses in the centre have become restaurants or bars. The more traditional pubs tend to be in the northern part of the town (Canbury) and include The Canbury Arms, Park Tavern, The Wych Elm and Willoughby Arms. Further south are found the Druid's Head, the Spring Grove, The Cricketers, The Albion Tavern, The Duke Of Buckingham, and several small local pubs around Fairfield. The Druid's Head is notable as one of the first taverns to make the famous dessert syllabub in the 18th century. There are several Chinese, Indian, Thai and Italian restaurants. The local newspapers are the weekly paid-for Surrey Comet, which celebrated its 150th year in 2004, and the free Kingston Guardian. A notable dramatic arts venue is the Rose Theatre. This theatre opened on 16 January 2008 and seats approximately 899 people. The audience are arranged around the semi-circular stage. All Saints Church is host to classical choral and music concerts mostly on Saturdays and houses a Frobenius organ. There are a number of choral societies including the Kingston Orpheus Choir and the Kingston Choral Society, an amateur symphony orchestra the Kingston Philharmonia, and the Kingston and District Chamber Music Society. A number of annual festivals are organised by the Council and Kingston Arts Council including Kingston Readers' Festival, Think-in-Kingston and the Festival of the Voice. Kingston University runs the Stanley Picker Gallery and Kingston Museum has a changing gallery on the first floor. A regular singing group at the Rose Theatre caters to schools and families. Kingston has been covered in literature, film and television. It is where the comic Victorian novel Three Men in a Boat by Jerome K. Jerome begins; cannons aimed against the Martians in H. G. Wells' The War of the Worlds are positioned on Kingston Hill; in The Rainbow by D. H. Lawrence the youngest Brangwen dreams of a job in Kingston upon Thames in a long, lyrical passage; Mr. Knightly in Emma by Jane Austen regularly visits Kingston, although the narrative never follows him there. Kingston is mentioned (and used as a filming location) in episodes of Monty Python's Flying Circus. More recently, a scene from Mujhse Dosti Karoge, a Bollywood film starring Hrithik Roshan as the leading actor, was filmed by the toppled telephone boxes sculpture in Old London Road. A scene in the television programme The Good Life sees Richard Briers get on a 71 bus in 'The Avenue' towards Kingston town centre (albeit this route never served the east side of Surbiton where the series is set). The 1974 Doctor Who story "Invasion of the Dinosaurs" used several locations in the town for filming. The 2008 series of Primeval, shown on ITV1 in January, featured almost an entire episode filmed inside the Bentall Centre and John Lewis department stores. Kingston featured in Primeval again in May 2009 with several scenes shot in and around the Market Place. Nipper, the famous "His Master's Voice" (HMV) dog, is buried in the town under Lloyds Bank. His owners lived nearby in Fife Road. Kingston Green Fair was held annually from 1987 to 2008 in Canbury Gardens, next to the river, on the Spring Bank Holiday. The word "Green" in the title refers to the ethos of the fair as promoting sustainable development. For instance no meat or other products derived from dead animals were allowed to be sold, and no electricity was permitted on the site unless generated by wind, sun, or bicycle power. Kingston is also home to Crack Comedy Club which opened at The Grey Horse Pub in 2002. One of the more unusual sights in Kingston is Out of Order by David Mach, a sculpture in the form of twelve disused red telephone boxes that have been tipped up to lean against one another in an arrangement resembling dominoes. The work was commissioned in 1988 as part of the landscaping for the new Relief Road, and was described by its creator as "anti-minimalist". Norbiton is east of the town centre near Kingston Hospital, and Hampton Wick is to the west across Kingston Bridge. New Malden, Wimbledon and Richmond upon Thames are on the lines. A primary stop exists on the nearby main (express) line in nearby Surbiton which has a peak hour non-stopping service to Waterloo. The town led to the South Western Main Line being in Surbiton as much of Kingston's wealth and status were as a direct consequence of the road and stagecoach network developed as a result of its crossing on the Thames. Local landowners would not consent to the line coming through their land so in 1838 the rail station was built a few miles out at Surbiton, which was known as Kingston Upon Railway and led to the development of Surbiton. Kingston recognised the need for a railway, and in the 1860s Kingston opened. However, due to the eastern landowners' resistance, the line had to take a longer route via Richmond upon Thames. Only later did the line receive all the relevant permissions for a closer link, connecting to London Waterloo via Norbiton. The A3 road runs from central London towards Kingston before by-passing the town to the east. The "Kingston bypass road" was one of the first arterial roads to be built in Britain. It was originally proposed in 1912 to relieve the pressure of traffic in the town centre, but World War I delayed the start of work until 1924. It was opened by Prime Minister Stanley Baldwin on 28 October 1927. Kingston is also served by the A240, the A307 (Portsmouth Road), A308 and A310. Kingston has a large number of car parks, connected by a one-way system. It is also one of the main centres of the south-west London bus network. Riverboats run regularly between Kingston and Hampton Court as well as Richmond all during the summer season. There are also direct services to Putney and Westminster from Hampton Court connected by the 10–15 minute interval route 111 to London Heathrow, the destination for X26 an express service also serving the bus station and the Bentall Centre. Of more local note, bus services connect in most directions, including Dorking and Tooting Broadway. Kingston is the location of Kingston University and Kingston College. There are 34 Primary schools (including Infant and Junior), of which 14 are Church Schools, 10 Secondary Schools and 14 Private schools which provide education for all age ranges. Primary schools include Latchmere School, Fernhill School and St Agathas Catholic Primary School. 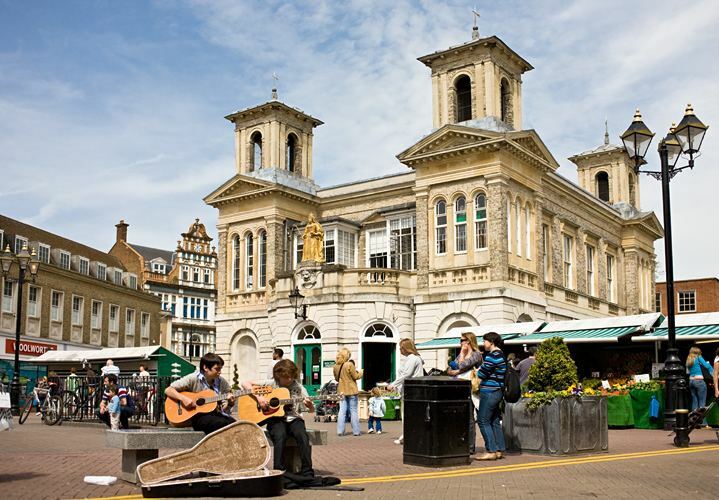 Kingston also is home to Tiffin School, The Tiffin Girls' School and Kingston Grammar School, all of which have large catchment areas across Greater London and Surrey. The 12th century church of All Saints serves the Church of England parish of Kingston which lies ecclesiastically in the Diocese of Southwark, although there has been a church in Kingston since at least 838. The suffragan or Area Bishop of Kingston is the Rt Rev. Dr Richard Cheetham. Other Anglican churches in Kingston, of more recent date, are St John the Evangelist and St Luke. Kingston lies in the Roman Catholic Archdiocese of Southwark, and there is a Roman Catholic Church dedicated to Saint Agatha. Kingston is also the home of the Kingston Surbiton & District Synagogue. Kingston also has a Quaker meeting house, a Mosque and a Sikh Gurdwara. Kingston is the home of four association football clubs, AFC Wimbledon and Kingstonian, both of whom play at the Kingsmeadow Stadium, Corinthian-Casuals who play in Tolworth and Chessington & Hook United who play in Chessington. AFC Wimbledon have played in League One since the 2016–17 season, whereas Kingstonian, Corinthian-Casuals and Chessington & Hook United are non-league clubs. Kingston Athletic Club and Polytechnic Harriers are based at the neighbouring Kingsmeadow athletics stadium. This stadium boasts a 400m track which is floodlit, a gym and 5-a-side football facilities. In the 2013 season the men competed in Division 3 of the British Athletics League. Kingston Rugby Club is based on the outskirts of the town, and Kingston Rowing Club is based on the River Thames. Kingston Regatta takes place on the river at the town in July. The town has a large leisure centre next to Fairfield named the Kingfisher Centre, which contains an indoor swimming pool and gymnasium. Sport in Kingston is promoted and encouraged by Sport Kingston, an organisation funded by the Royal Borough of Kingston. Kingston Wildcats School of Basketball is a community basketball development club that practices and plays its home fixtures at Chessington Community College, competing in the Surrey League and Basketball England National League. The borough was the setting for four cycling events during the 2012 Summer Olympics, the men's road race, women's road race, men's road time trial and women's road time trial. Prior to the opening of the games, Kingston hosted the 2012 Summer Olympics torch relay on two occasions with the flame travelling through the borough on 24 July 2012 and aboard the Gloriana in a cauldron on 27 July 2012 en route to the Olympic Stadium for the opening ceremony. Kingston upon Thames has been twinned with Oldenburg in Germany since 2010. It also has been historically twinned with the town Delft in the Netherlands. In 2016, Kingston upon Thames has been twinned with Jaffna in Sri Lanka.